52 Ancestors, No. 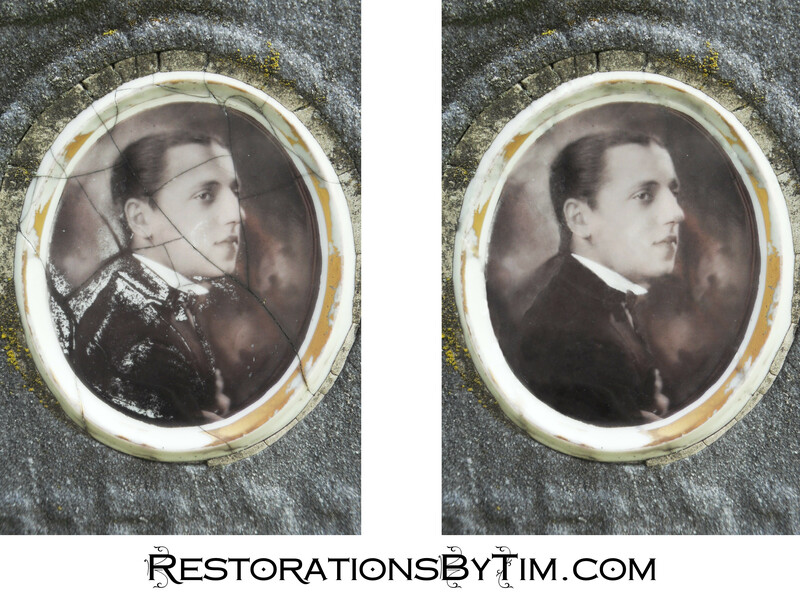 2: Samuel Harmon Anflick, Big Band Violinist | Photo Restorations by Tim G.
I took an interest in my maternal grandfather’s family early on for three reasons: First, he died in in 1986, when I was five years old, so my memories of him are barely there. I could nary remember what he looked like before my mother showed my some pictures for my nascent genealogy project. Researching him and his family is a way to make up for lost time. Second, he was Jewish, whereas my other three grandparents were Catholic. I was raised Catholic, myself, so researching his family has been like adopting a new culture. Perhaps most of all, however, the name fascinates me. The name Anflick is apparently quite rare, and I’d like to discover its origin. My line of Anflicks came from Odessa, in what was then the Russian Empire. They settled in both Philadelphia, Pennsylvania, and Richmond, Virginia. Another line of Anflicks has roots in Durham, England, and some of them migrated to Ohio in the mid 19th century. The Durham Anflicks were Christian, and I’ve never established a relationship to them. My uncle suspects that some of them may have migrated to Odessa long ago, in search of a livelihood in mining, and married into Jewish families there. As it stands, that is a narrative in search of evidence. The first of my Anflick ancestors, Louis, arrived in America in 1899. His younger half-brothers, Harry Anflick and my great-grandfather, Henry Anflick, followed a couple years after. A couple years after that, their sisters, Mary and Anna arrived, along with their mother, Katie. Louis resumed his profession a barber upon his arrival, and married Esther Leibowitz, whom he met on his trip to America, so I hear. Their first child, Samuel, was the first Anflick from my line born in America. He was the nephew of my great-grandfather, Henry, and the cousin of my grandfather, Morris. Sam’s birth return, completed by midwife Sali Einhorn. Midwife Sali Einhorn delivered Samuel Harmon Anflick on February 12, 1902, in home of Samuel’s parents, 710 S. 3rd St., Philadelphia. Einhorn’s birth return for that month is above. 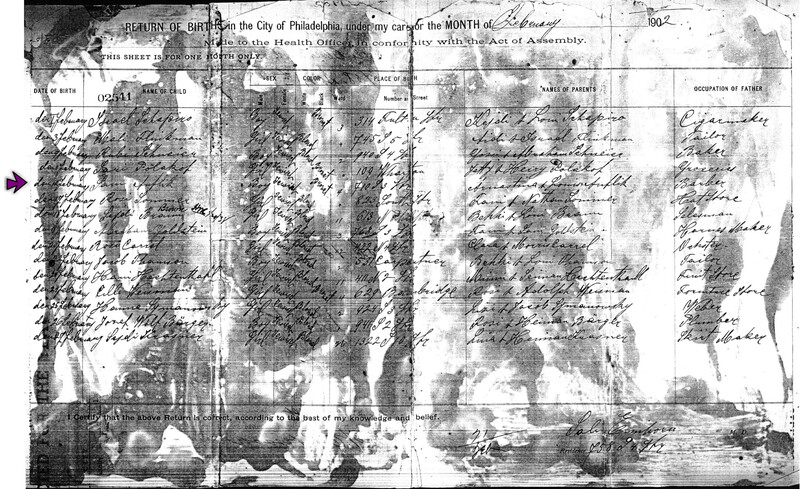 It looks damaged; most birth return copies from the Philadelphia City Archives do not show such dark and pervasive staining. Fortunately, the information is all legible, so the history survived. What I especially love about Mrs. Einhorn’s return is that in the column labelled Color, she apparently wrote the color of the child’s hair, i.e., “blond” for white, and “bronet” for black. I can only speculate as to what her thoughts were, but she comes across to me as delightfully naïve about our nation’s continually tumultuous his history of race relations. I suspect that Mrs. Einhorn responded to the needs of her Jewish community, and likely did not perchance deliver African-American children. The Color column apparently served no more useful purpose for her than that for which she used it. Let the record show that Sam Anflick was a “bronet”. The Anflick family had always been musical. After two decades as barber in Philadelphia, Louis Anflick opened a music store, which I would love to see in a picture some time. One of Louis’s daughters, Edith, played piano for silent films at the Ideal Theater in Philadelphia. Another of Louis’s sons, Sidney, was a songwriter, and my cousins on the West Coast are in the process of tracking down his officially released compositions. Louis’s grandson, Sammy Anflick, was a beloved jazz drummer in Philadelphia, and later in Greensboro, North Carolina. My mother’s Aunt Perri was a Philadelphia local songstress and radio personality. My mother’s Aunt Rose left behind some home recordings of her piano compositions. Even back home in the motherland, I recently learned of a distant cousin who played violin in the Russian National Orchestra. Samuel Harmon Anflick was another violinist. I was honored to meet Samuel’s last surviving sibling, Lillian, a couple years ago. At 96, she is the last of her generation. Lillian described for me Samuel’s violin antics. She told me that he would play the violin under his leg, behind his back, et cetera. It reminded me of a Willie Hall video I had seen on YouTube a while before. Lillian couldn’t have been more than age ten when she witnessed this, so she was reaching back quite a ways for this memory. 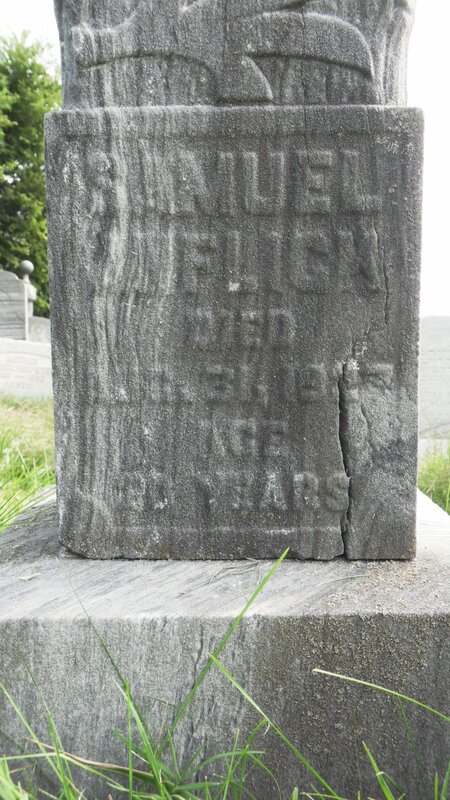 I believe I had heard from people who knew that Samuel Anflick died before his time, but nobody could recall either his date of death or place of burial. Lillian had a photograph of her older brother, Samuel, hanging up on the wall. I tried to snap a copy with my digital camera, but it came out blurry. I hope I get another opportunity…..
Samuel was present with his family in the 1920 census, but after that was a mystery until the old MyHeritage.com brought me my next lead. They had this thing called “Meta-Search“ that would run a name through hundreds of databases and return scads of results, one of which was for a New York City marriage record from the Italian Genealogical Group’s NYC groom database. Samuel was not the slightest bit Italian, but that’s beside the point. The point is that he did marry one Pauli Hoffman on Valentine’s Day, 1922, two days after his twentieth birthday. Pauline was also born in Philadelphia. I’m not sure whether the two met in Philadelphia or in New York, but according to their marriage license application they both had New York City addresses at the time of their marriage. Samuel listed his occupation as Musician. I don’t know anything more about Pearl, and the couple had no children to my knowledge, but there are some avenues for research there. The marriage license application identifies her parents. So by the early part of 1924, the personnel of the Jean Goldkette Orchestra at the Graystone was: Standley “Doc” Ryker, Jimmy Dorsey, Don Murray (reeds); Fred Farrar, Ray Lodwig, Bill Rank, Tommy Dorsey (brass); Paul Mertz, Dewey Bergman (pianos); Howdy Quicksell (banjo); Irish Henry (tuba); Charlie Horvath (drums); Joe Venuti (violin). The orchestra also used violinists Sam Anflick and Charley Hammel during waltz nights. How the article’s author, Stan Kuwik, came to know about Sam’s participation in the band is a mystery to me. I understand that Stan is no longer around to ask, but perhaps the newsletter’s current editor might point me in the right direction. The Graystone Ballroom was a fixture of Detroit, Michigan. I assume that Sam moved to Detroit to participate in these so-called waltz nights. I do not yet have any other evidence of residency, and I don’t yet know if Pearl followed him. In addition to the IAJRC journal, Sam Anflick’s name appears in biographies of jazz trumpeter Bix Beiderbecke, who first joined Goldkette’s orchestra in October of 1924. Sam was apparently still with the band, and in Detroit, as of that time. The Dorsey brothers’ participation in the band should not pass without mention. For those unfamiliar with the giants of 1930s swing, Tommy Dorsey’s name is there with the likes of Glenn Miller and Benny Goodman. Even the uninitiated may have heard such Dorsey hits as Song of India and Lady Is A Tramp, tunes with which I was enamored when I moved into my first apartment in December of 2001. Dorsey’s band launched the careers of such superstars as Buddy Rich and Frank Sinatra, so Sam was in quite good company, even if only on waltz nights. This is a big deal! Jean Goldkette’s orchestra recorded twice during 1924 for Victor records, one session in late March, and another in late November. The University of California, Santa Barbara hosts an extensive encyclopedia of Victor’s recordings, including the Goldkette Orchestra’s 1924 sessions. Unfortunately for my genealogy project, Sam Anflick’s name does not appear among the recording personnel on any of those sessions. The November session credits Joe Venuti as violinist. The March session, however, credits only “Jean Goldkette Orchestra” as the performer, and does not list any players by name. “Victor Ledgers” receives credit as the information’s source. I would be interested to see these ledgers. Let me call your attention next to the tune called Honest and Truly, from the November recording session. Joe Venuti is on violin, here, according to the personnel list. Although Sam does not appear on the list, this is almost certainly a waltz of the kind he would have participated in playing when he joined the orchestra at the Graystone Ballroom on “waltz nights”. The Library of Congress hosts the audio sample. In addition to this activity, Google Books also revealed a pair of copyrights in Samuel Anflick’s name: Un-m-m-what a Day, with words and music by Sam Anflick, Gus Borguno, and Frank Baer, © 1 c. Feb. 4, 1927, and Do You Think You Would, with words by S. H. Anflick and music by Francis Keegan Schuman, © 1 c. Feb. 12, 1927. I am not presently familiar with any published recordings or sheet music for these pieces, but I sure would like to see what the U.S. Copyright Office has on file for these index entries. According to the front material of the index, “1 c.” means that the office has received one copy of each piece. Sam’s name is associated with the location of Washington in these index entries. I’m not quite sure how to interpret this location, but I suspect in means that Sam had left Detroit and was working out of Washington, D. C., when he had these pieces copyrighted in 1927. I intend to plan a trip to Washington soon to look up these pieces. 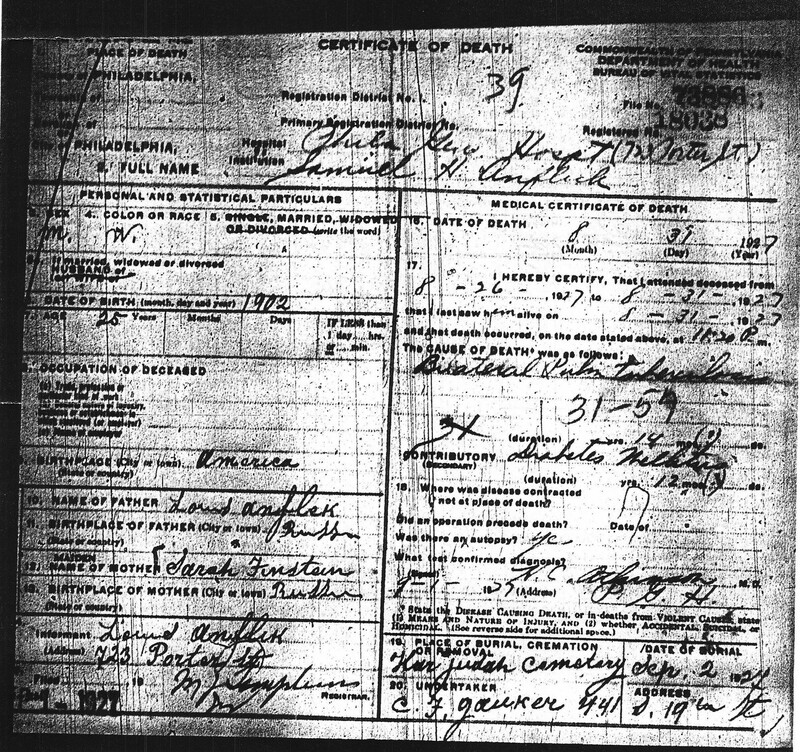 Samuel Anflick’s Death Certificate, August 31, 1927. I imagine Samuel must have fallen ill sometime during the spring of 1927 and returned home for treatment. He died of pulmonary tuberculosis at Philadelphia General Hospital on August 31, 1927. Diabetes Mellitus contributed to his death. Samuel left us again, with another mystery. Whereas his birth certificate identified his mother as Arnestina (aka Esther) Anflik (nee Leibowitz), whom all other documents identify as the mother of all of Louis Anflick’s children, Louis himself identified Samuel’s mother as Sarah Finstein on Samuel’s death certificate. I have no idea who Sarah Finstein is, or why Louis wrote her name on this document. Nothing is quite as it seems in the Anflick family, and that’s what makes it so fascinating to research! 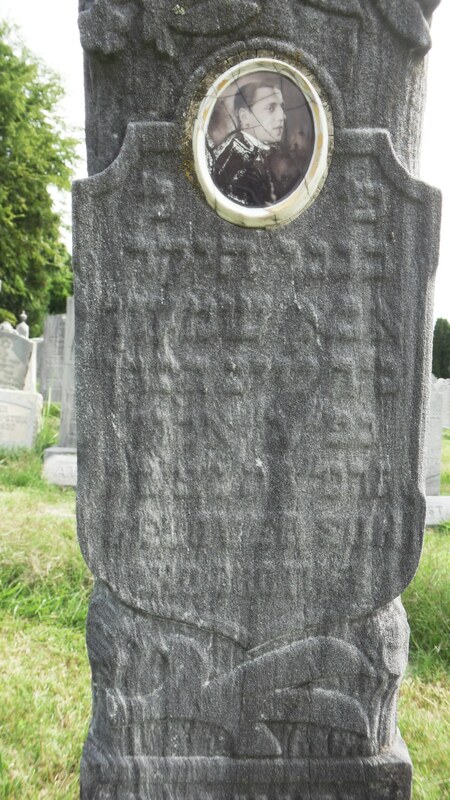 The death certificate did correctly identify Samuel’s place of burial as Har Judah (aka Har Jehuda) Cemetery in Upper Darby, Pennsylvania, just west of Philadelphia. Samuel’s grandmother, Katie, is also buried there, albeit in a different row. 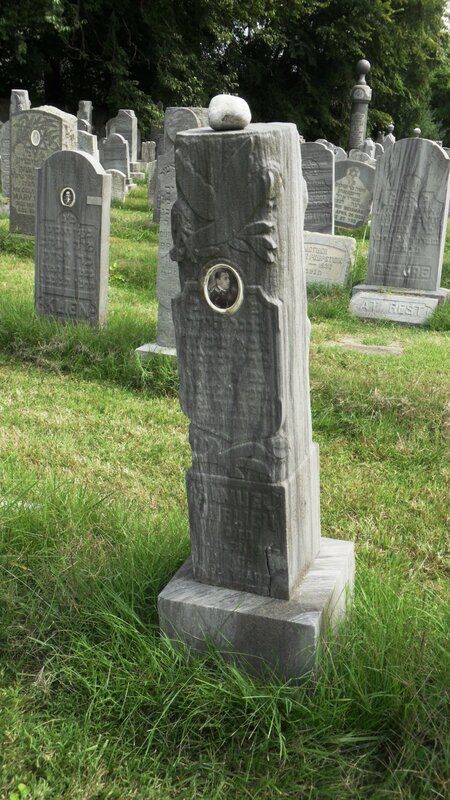 Whereas Katie’s grave is unmarked, Samuel received a proper monument: a stone tree trunk with a ceramic photograph of the musician. Atop the trunk rests a veritable boulder with a story to tell, but which unfortunately can not speak. Placing stones on graves is a cherished Jewish tradition. Somebody regarded Samuel very highly, and wanted every passerby to notice. The ceramic picture shines like a gem, but it is showing signs of its frailty. This image is complete for now, but it’s only a matter of time before pieces start to go missing. 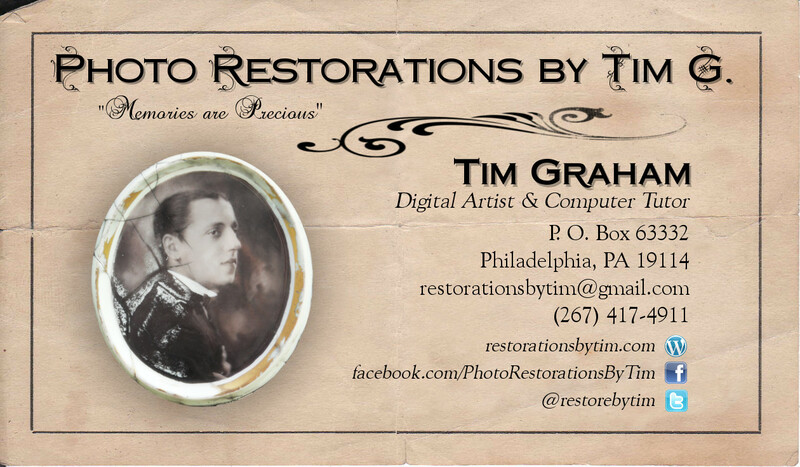 I was so enamored with this restoration that I made it my company logo. You’ll see Samuel’s face on my twitter feed, my business cards, my invoices, etc. I think his image best represents what I am trying to do with this web site and this business, which is to rescue our fading ancestors from the brink of total obscurity.